ZONES 1,21,2,22 GAS AND DUST. 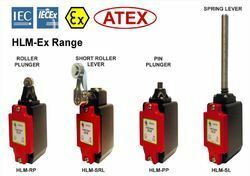 IDEM's ATEX Certified range of HLM-Ex Explosion Proof Safety Limit Switches have been manufactured with Heavy Duty Die-Cast Metal bodies and have been designed to be mounted for position sensing of moving applications e.g. guard doors, conveyors, machine beds, elevators in atmospheres where the potential for explosion exists. They are available with a choice of linear or rotary heads. Operation of the switches is achieved by a sliding actuation of the moving object to cause deflection of the switch plungers or levers. For safety applications it is important that the moving object does not pass completely over the switch actuators so as to either cause damage to the actuator or allow it to return to its original position. 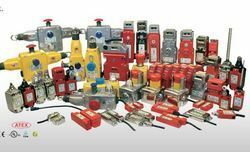 All HLM Explosion Proof Limit Switches are supplied pre-wired with 3m of cable. Heavy duty die cast body. Industry standard mounting to EN50041. 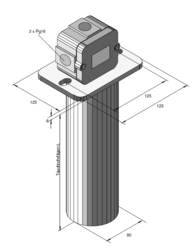 Choice of actuator heads: Linear and Rotary. High mechanical life 5,000,000 cycles. Rated IP67 making them suitable for washdown. 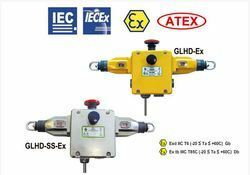 ATEX EExd IIC T6 Certified Explosion Proof Contact blocks. 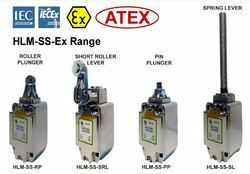 IDEM's ATEX Certified range of HLM-SS-Ex Explosion Proof Safety Limit Switches have been manufactured with Stainless Steel 316 mirror polish finished bodies and have been designed to be mounted for position sensing of moving applications e.g. guard doors, conveyors, machine beds, elevators in atmospheres where the potential for explosion exists. Heavy Stainless Steel 316 body. Rated IP69 making them suitable for washdown. IDEM's range of Explosion Proof E stop switches can withstand sparking and flames and are IECEx and ATEX certified. ZONES 1, 21, 2, 22 GAS AND DUST. STAINLESS STEEL 316. M30 x 1.5mm THREADED BODY. 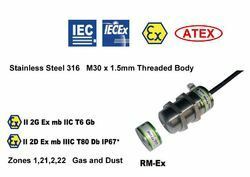 IDEM's RM-Ex Explosion Proof Non Contact Switch is manufactured with a Stainless Steel 316 Cylindrical housing making it suitable for industry applications where the threat of explosion exists, particularly in the hazardous conditions created within the Petro-Chemical, Food Processing and Pharmaceutical industries. The RM-Ex is designed with highly reliable power reed switching elements, contacts de-rated and protected by internal fuses with high tolerance to guard misalignment. Manufactured with a magnetic sensing system which provides a wide sensing distance and provides a high tolerance to misalignment after sensing. The RM-Ex can be fitted behind stainless steel fittings and can operate in extreme environments of temperature and moisture. The switch comes pre-wired with either 5M or 10M of cable and is available with 2NC 1NO circuits. (a) poor guard alignment exists. (b) high hygiene requirements exist, e.g. food industry hose down. (c) a long mechanical life is required (no moving or touching parts). Installation of all IDEM Non Contact EX Switches must be in accordance with a risk assessment for the individual application. switched with virtually no inertia. Rail Mounted Crane Wheel Location Sensors. Rail Mounted Crane Wheel Location Switch. Train Location and Position Control Sensors. 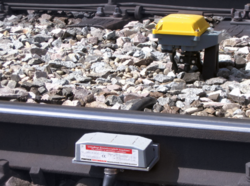 Location Sensors for Wagons in Mines, Steel Plant, Power PLant and Port Applications. Non Contact and Activation by Wheel of the Crane, Railway, Train or Wagon. No effect of rail currents, radio frquency, harmonics or any other. For More information Just send us an e mail. 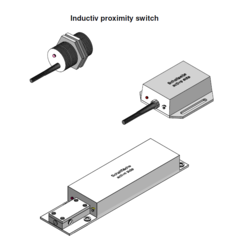 Advanced Inductive Proximity Switches for Steel Plants, Chemical, Fertilizer, Process, Mines, and Related applications. For operations in Ambient Temperature 100*C or 125*C, for example extremely close to Ladle or Hot Metail Applications in Steel PLants or In Chemical Cracker Plants in Oil and Petro Processing. A ,,shielded" or ,,flush' proximity switch will not be affected by surrounding metal. An ,,unshielded' or ,not flush" proximity switch must have an open space around the active face. d >d d Steel shielded shielded If proximity switches are installed opposing one another, the op posing switches must be installed with a spacing of 3 x the switch diameter between them. these conditions the switching point must be within a tolerance of 10 %. b) Real sensing range Sr This is the actual switching distance for an individual proximity switch lt is measured at nominal voltage and ambient temperature of 20 ºC and will be between 90 % and 110% of Sn. 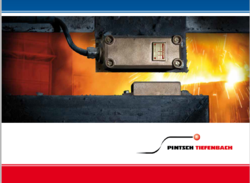 Select from a Wide Range of Level Switches for All Applications in Steel PLant, Mines, Power PLants, Nuclear Power Plants, and other Industrial applications like Petro and Chemical. by-pass pipe with high-grade steel ribbons. switching distances between the switches are possible. the medium and is operated with the swimmer magnet. 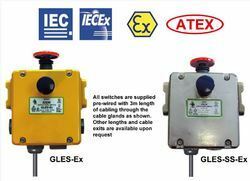 Looking for Atex Electrical Safety and Interlock Switches ?